Broken Dolls (Broken Dolls #1) by Tyrolin Puxty looks so creepy and awesome that I have to add it to the TBR list. I’m going to try to keep my resolution to only buy new books once I have finished at least 5 of my old ones, so this one is going to have to sit on the back burner until later. I’m totally in love with the cover though. 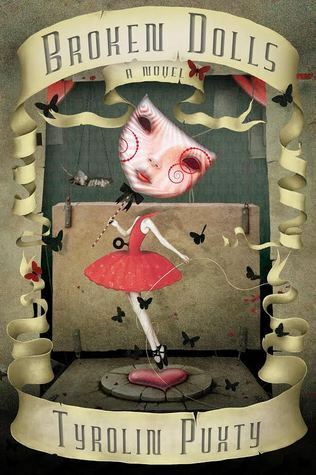 Synopsis: Ella doesn’t remember what it’s like to be human; after all, she’s lived as a doll for thirty years. She forgets what it’s like to taste, to breathe…to love. She watches the professor create other dolls, but they don’t seem to hang around for long. His most recent creation is Lisa, a sly goth. Ella doesn’t like Lisa. How could she, when Lisa keeps trying to destroy her? Ella likes the professor’s granddaughter though, even if she is dying. It’s too bad the professor wants to turn Gabby into a doll, depriving her of an education…depriving her of life.